This is definitely a cheater recipe, starting with both a chocolate cake mix and chocolate pudding mix. But it is easy, delicious and super-moist. Perfect. 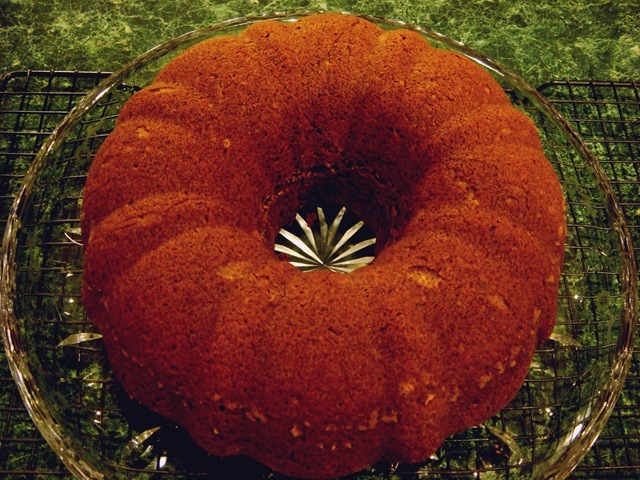 And baked in a bundt pan it makes a beautiful dessert suitable for serving company. This is especially delicious served with a scoop of vanilla ice cream on top of each slice. Preheat oven to 350°F . Grease and flour a bundt pan (or spray with baking non-stick cooking spray: the kind with flour in it). In a large bowl, mix together the cake and pudding mixes, sour cream, oil, eggs and water. Stir in the chopped chocolate and pour batter into prepared bundt pan. Bake for 45-50 minutes, or until a toothpick inserted in the center comes out clean. Cool cake completely in the bundt pan for about 90 minutes. Invert onto a serving plate and drizzle with glaze. If desired, serve each slice topped with a scoop of vanilla ice cream. Place the chopped chocolate into a small bowl and set aside. In a Pyrex measuring cup or microwavable bowl, combine the heavy cream, corn syrup and sugar. Heat for 1 minute; stir. Pour the hot cream over the chopped chocolate. Let sit for one minutes, then stir until smooth with a whisk. Use a spoon to generously drizzle the glaze over the cooled cake, allowing it to drip down the sides. This is a quick and easy dessert that looks much more complicated than it really is. With only 5 real ingredients (7 if you frost the cake) that I always have on hand, it makes a great last minute dessert. This cake actually starts with a vanilla cake mix. You could use a chocolate cake mix for a richer chocolate flavor, but then you would have to make your own peanut butter filling, or use part of a vanilla cake mix for that. I’m all for simplicity, so I transformed my vanilla cake mix into a chocolate one by mixing a chocolate pudding mix into most of the vanilla cake batter. The remaining vanilla batter is mixed with peanut butter for the peanut butter filling layer. 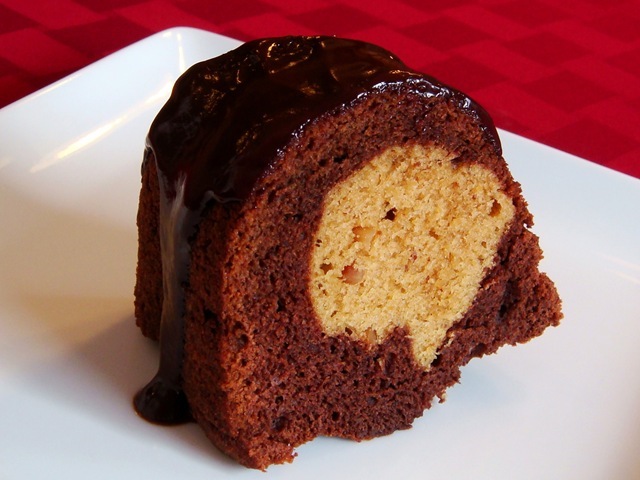 When filling your bundt pan, start by adding about 1/3 of the chocolate batter to the pan. Spoon the peanut butter batter over the chocolate layer, keeping batter away from the edges of the pan (so it won’t show on the outside of the cake). Spoon remaining chocolate batter over the peanut butter layer. You can eat this cake plain, but it is so much better with a simple chocolate glaze (or ganache if you want to sound fancy!). Just a mixture of cream and bittersweet (you could use semi-sweet) chocolate. Lovingly drizzled over the edges of your cake. 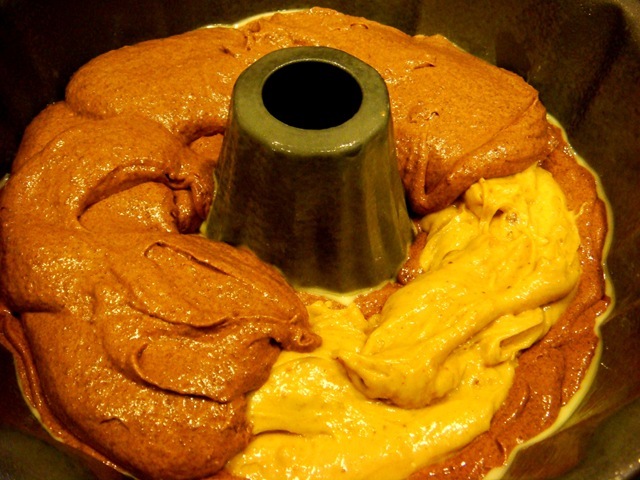 In a large mixing bowl, use a mixer to beat together the cake mix, water, oil and eggs. Remove one cup of batter to a small bowl. Beat peanut butter into reserved one cup of batter. Add the chocolate pudding mix to the large bowl of batter. Beat until well combined. Grease and flour a 10-12 cup bundt pan (or use non-stick baking spray with flour). Spoon about 1/3 of the chocolate batter into the prepared bundt pan. Spoon peanut butter batter over the chocolate layer, keeping batter away from the edges of the pan. Spoon remaining chocolate batter over the peanut butter layer. Bake at 350°F for 40-45 minutes, or until a toothpick inserted in the center comes out clean. Cool in pan on a wire rack for 10 minutes. Invert onto serving plate and cool completely. Top with Chocolate Ganache frosting, if desired. Place chopped chocolate in a mixing bowl. In a saucepan, heat cream until it comes to a boil. 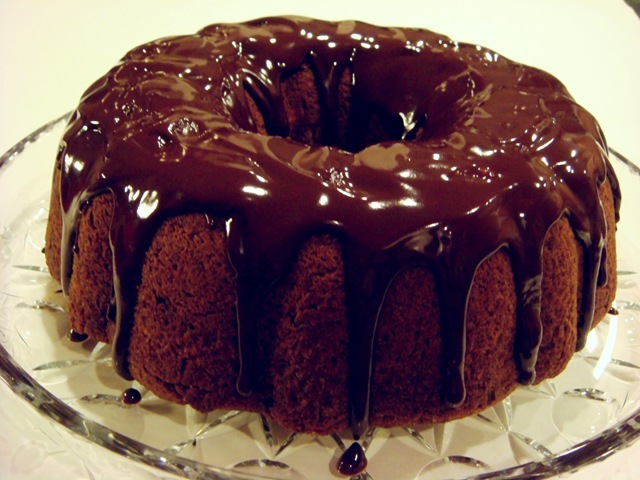 Pour cream over chocolate in mixing bowl and stir until chocolate is melted and glossy. Stir in flavoring, if using. Cool ganache slightly (until thick enough that it won’t run off of the cake, but warm enough that it will still drizzle). Pour ganache over cake, starting in the center of the cake, allowing it to drip down the sides. The longer you allow the ganache to cool, the thicker it will set. 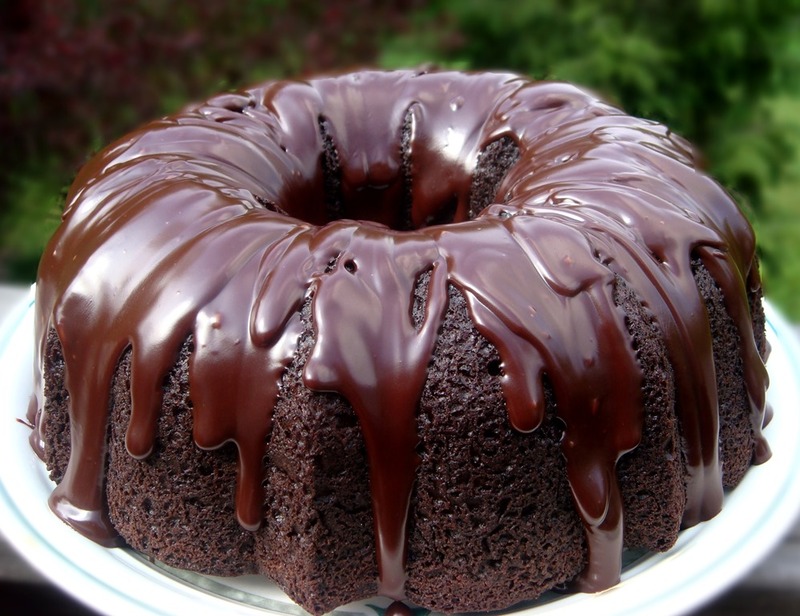 For piping or for a regular cake frosting, allow the ganache to completely cool and set up at room temperature. Mix with a whisk slightly just before frosting the cake. For a thicker, fluffy frosting, or filling for a cake, chill the ganache in the refrigerator until slightly cold, then whip with a mixer until light and fluffy.